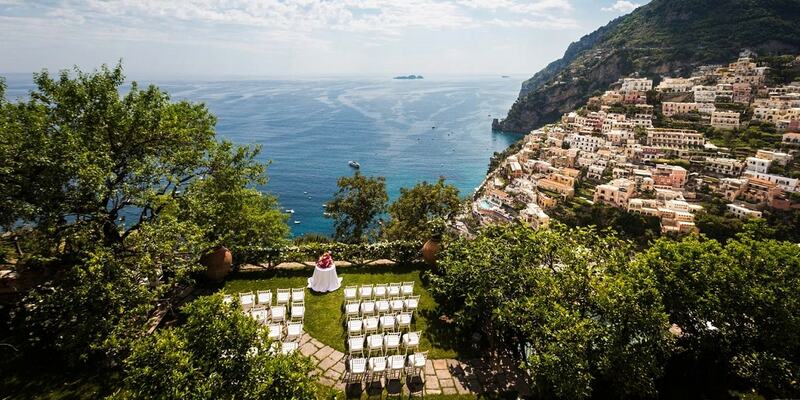 A wedding in a garden on the properties of private villas, castles, hotels of Amalfi Coast facing the sea is something you will never forget. Simbolic, civil and no-catholic cerimonies , and wedding reception can be arranged in one of this beautiful venues. The ideal season for a garden wedding is in the Spring/Summer or in September and October, when these beautifully and unique venues provide a stunning backdrop for your ceremony and wedding photographs you will treasure. Here you can look at some of garden wedding venues that where we can coordinate your wedding in Italy. A splendid villa in late liberty style, with a protracted harmonic outline has been always an ideal location for ceremonies, exclusive meetings and weddings in ravello. Located next to the historical centre, is a small jewel of 3000sqm park of centenary trees and thanks to its position, enjoys a splendid 360° view of the coast below.